Rich Country, Poor People: Can New President Fix Angola's Economy? Angolans have elected their first new president in nearly four decades and they say he must address the glaring gap between rich and poor. Despite being Africa’s second largest oil producer, most of Angola's citizens live in poverty, amid runaway inflation and high unemployment. On a good day, Kialopo Feliciana brings in about $18 selling food at a market in an impoverished Luanda neighborhood. "The business is very expensive," she told VOA one recent morning, as she churned a large pot of maize porridge, stopping to wipe sweat off her brow. "That is why I have got little money for home expenses." Angola’s economy is so crippled by inflation that her daily take home is worth about $9. Her entire family depends on that, she says, because although her adult son has a certificate, he can not find a job in a nation where unemployment hovers around 26 percent. But across town, mansions, million-dollar condominiums, and upscale stores line a few city blocks. At a high-end gelato shop, patrons can spend Feliciana’s entire daily income in one outing. 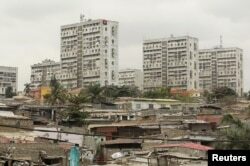 FILE - High-rise buildings are seen behind informal settlements in the capital of Luanda, Angola, Aug. 30, 2012. Retiring President Jose Eduardo dos Santos lives here, in a yellow mansion that overlooks the busy port and a maze of slums on the hill below. During his 38-year rule, he has been consistently accused of spending the government’s oil income on himself and his inner circle. Here, the wide roads are paved and lined with old-growth trees and pretty tiled signs, a holdover from Portuguese rule that ended in 1975. In Feliciana’s treeless neighborhood just a few kilometers away, the roads are unpaved, and mounds of stinking waste sit just meters from homes where toddlers play in the dirt. Angola is Africa’s second-largest oil producer, yet that wealth has clearly not trickled down. President-elect Joao Lourenco, who is dos Santos’ chosen heir, says he wants to lessen dependence on oil. He wants to develop agriculture, industry, tourism, fisheries, and other branches of the economy, he told a crowd at his final pre-election rally. But his political opponents say the problem is far simpler. This poverty is not because of a drop in oil prices, opposition lawmaker Manuel Fernandes told VOA, it is because of bad governance. But longtime government critic and journalist Rafael Marques says Lourenco is in a difficult situation because dos Santos still controls much of the nation’s wealth. It is a tough situation for Lourenco, as he prepares to take the reins once the official count is settled, but for Angola’s millions of poor change cannot come soon enough.